When I first saw the summary for Cruel Beauty, I was really excited! It seems like such a different take on re-tellings, and I love that it’s a blend of Greek mythology and Beauty And The Beast. So when I started reading, I wasn’t sure about it, but by the end I was enjoying it a lot more than I was at the beginning. So, here’s why I wasn’t sure about it at first. There is this very alternate history feel to the book. which is awesome, but it also made me feel like there was some piece of history that I was missing, and wasn’t being explained. It very much felt like I needed to have some special knowledge to know what was going on, and it was driving me crazy that I didn’t know what it was. It definitely takes a few chapters before you learn what’s going on. Despite me feeling like I was missing some key knowledge at the beginning, I came to really like Cruel Beauty. Nyx is an interesting character, and it’s interesting how drawn she is to Ignifex. Ignifex is also an interesting guy, and I really like their relationship, which really changes throughout the book. I really liked Ignifex’s castle, which was described really well, It’s creepy but very vivid, and I could picture it so well! Much better than the world that the castle resided in, because that world…there’s something about it that doesn’t seem completely explained. Then again, most of the book focuses on Ignifex and Nyx, so perhaps that part of things doesn’t need to completely be there. I’m not sure how I feel about the romance. Maybe it’s because of Nyx’s mission, or something else I can’t identify, but I wasn’t completely into the romance. 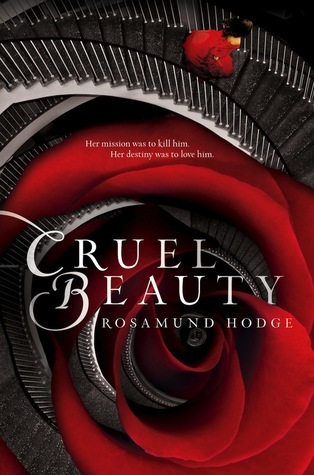 Initially, I felt slightly confused by what was going on, and I felt like I was missing something, but as the book went on, I got really into Cruel Beauty. It’s a very detailed world, and there’s something very intricate and vivid and imaginative about this world. It’s definitely a great read for fans of fairy tales and Greek mythology. Cruel Beauty gets 4 stars. « Currently Obsessed With #3: March Is Over Already?!?!? !